One pound (16 oz) of an incredibly unique treat. People can’t get enough of our famous Peanut Butter Wings. 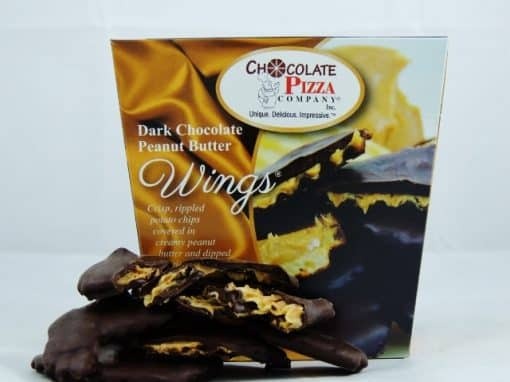 We make our world famous Peanut Butter Wings® using crisp, rippled potato chips, smothered in creamy peanut butter and then covered in our special dark chocolate. 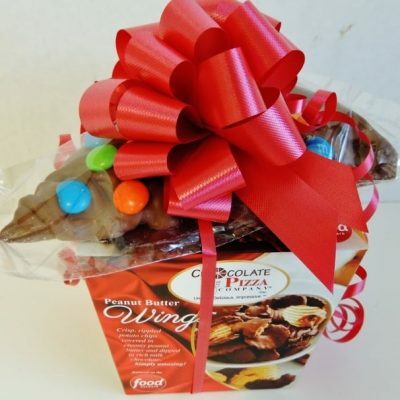 Our Peanut Butter Wings are the perfect compliment to our Chocolate Pizza® – a “Pizza & Wing Combo” that makes a fantastic gift. If dark chocolate is your weakness, then say “hello” to your new favorite chocolate treat. Peanut Butter Wings are consistently our top selling chocolate specialty and for a very good reason. They are insanely delicious! Dark Chocolate Peanut Butter Wings are crisp, rippled potato chips with creamy peanut butter spread generously on every chip and then drenched in rich milk or dark chocolate. Yes, we went there! We created a salty-sweet combination that will leave your taste buds shouting for more. 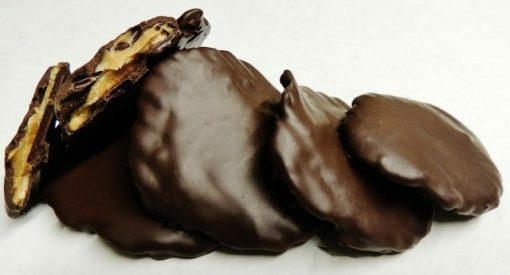 You get crunch from the chip, salty goodness from the peanut butter and melt-in-your-mouth sweetness from the gourmet chocolate. The thicker, rippled in the potato chips hold just the right amount of peanut butter which is why we don’t mess with ordinary chips. Try one and you’ll never look the same at chocolate and peanut butter again. Peanut Butter Wings are so unique they’re trademarked and Dark Chocolate Peanut Butter Wings are so delicious they should come with a warning label that you can’t eat just one. 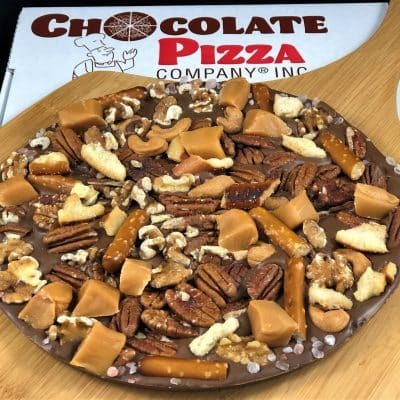 Chocolate Pizza Company makes over a quarter million Peanut Butter Wings a year. And to top it off, we make this masterpiece by hand – one at a time. Yep, Dark Chocolate Peanut Butter Wings are not no mass-produced. This is edible genius. Our chocolatiers spread peanut butter on every chip before placing it on a conveyor that takes it for a ride through a chocolate curtain and down a long, dark cooling tunnel where it emerges ready to make your day. Dark Chocolate Peanut Butter Wings – the large 16 ounce size – are made for sharing. You don’t have to but it is recommended. One thing for sure, one bite and you’ll never look the same at dark chocolate and peanut butter again. 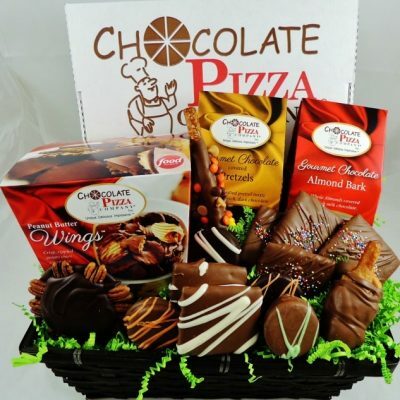 Remember, nothing pairs better with Dark Chocolate Peanut Butter Wings than one of our signature Chocolate Pizzas.